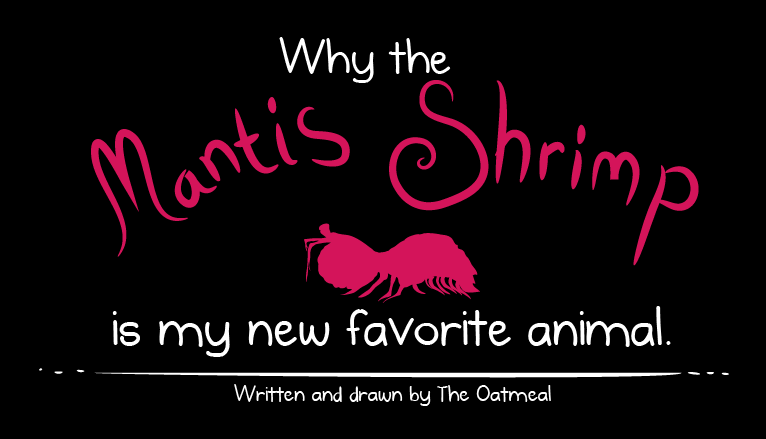 Reblogged: Why the mantis shrimp is my new favorite animal – The Oatmeal. Full credit for turning me on to this wonderful, beautiful creature of the sea came byway of my duo post colleague, the Scientist Gone Wordy, Rachel. Not only is The Oatmeal piece instructive, but it had me and daughter laughing inanely and repeating direct quotes from the article. Then, the “murder sticks” come into play. No kidding, you gotta read this…and my daughter and I are getting T-shirts. I actually read this the other day and was laughing out loud at some of it. I then Googled it and it’s all true as well! What a truly bizarre little animal! So true! It’s like this little creature has super powers. Thanks, Chris :-). Saw this a few days ago. it is amazing. When I grow up I want to be a mantis shrimp. My daughter, too. Thanks, Abbi :-). That Oatmeal site is absolutely hysterical but particularly the one you noted about the KILLER shrimp. Also there is one on Game Of Thrones that killed me. But Michael to bring it back to your site. I just want to note that you may be the single greatest champion of supporting other writers on the blogosphere. It’s very selfless of you and I commend you for your gracious support along with your own terrific work. It’s just one of your many terrific attributes my friend. I appreciate the kind words, my friend. Honestly, it’s easy to do because bloggers/writers like yourself produce so many great things I and others want and enjoy to read. The sharing seems the natural thing to do. The benefit/blessing for me is that it all comes back with others doing the same. It makes any effort so worth it. p.s., I’m going to look up that GoT, for sure. Ditto on Gordon’s final paragraph above!!!! Many, many thanks, Rachel :-).